In the old days, anyone on active duty could consume alcohol on military installations, regardless of the legal drinking age off-base. However, in the mid-80s, advocacy groups, such as MADD (Mothers Against Drunken Drivers) lobbied Congress to change this. Federal law (United States Code, Title 10, Section 2683) requires military installation commanders to adopt the same drinking age as the state where the military base is located. The only exception to this rule is if the base is located within 50 miles of Canada or Mexico or a state with a lower drinking age. In these instances, the installation commander may adopt the lower drinking age for military personnel on base. In the case of a Department of Defense installation located in more than one state, the state with the lowest minimum drinking age will take precedent. The minimum drinking age on a U.S. military installation located outside the United States is 18 years of age. Higher minimum drinking ages may be based on international treaties and agreements and on the local situation as determined by the local installation commander. The commander of a military installation may waive the above requirements if he or she determines that the exemption is justified by special circumstances. Special circumstances are those infrequent, non-routine military occasions when an entire unit, as a group, marks at a military installation a uniquely military occasion such as the conclusion of arduous military duty or the anniversary of the establishment of a military service or organization. The event must be held on a military installation. In those cases, it's up to the commander to ensure that appropriate controls are in place to prevent endangering military service members or the surrounding community. 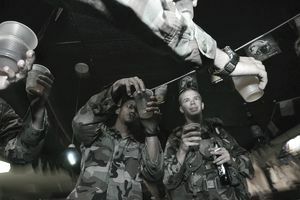 While the law and Department of Defense directives allow drinking on-base by those under the age of 21 if the base is located within 50 miles of a country that allows a lower drinking age, the Secretary of the Navy issued a Navy policy (which included the Marine Corps), which prohibited the practice. Until then, on-base drinking by sailors and Marines on bases within 50 miles of Mexico (such as Camp Pendleton) was common. A couple of years later, the Army followed suit, prohibiting on-base drinking on its bases (such as Fort Bliss, Texas, and White Sands Missile Range) which were within 50 miles of Mexico. The Air Force never did allow installation commanders to adopt the "50-mile rule." In 1997, the Marine Commandant issued a policy which restricted on and off base drinking for Marines stationed overseas to age 21, even if the host country had a lower drinking age law. But in September 2006, the Corps lowered the drinking age for Marines in Japan to 20 to reflect the local drinking age there. In April 2007, the Marine Corps Commandant signed off on a directive that allows 18-year-old Marines to drink alcohol in foreign ports if the host nation’s law allows it. The directive mandates that commanders "ensure that appropriate controls are in place to prevent endangering Military service members or the surrounding community," during such events.